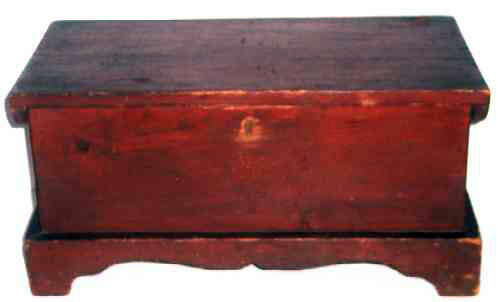 Outstanding and original Miniature Blanket Chest in Red paint from Pennsylvania, complete with till! It is a true survivor in fine untouched condition, dating from the 1820-30 time frame. It shows light wear and graceful aging with no paint touchups of any kind. The feet are original and untouched. The visible nails are hand wrought iron and blacksmith made. Great patina and oxidation with a nice dry finish, just the way we like it. The hinges, lock and keeper are all original to the piece. The lock is in the open position so that the keeper can go into the lock and seat the lid without locking the box. From the York - Lancaster, Pennsylvania area it measures 16-7/8" across the front x 9" deep x 8" high.